Life has a habit of making more of itself, but this is not everlasting. Once we’re alive, there’s great momentum to keep life going, and it takes a major event to interrupt the habit. As a result, we assume that our lives go on endlessly and forever. But our timestamp expires, even though we don’t know how or when. It’s common to evaluate our net worth in financial planning, but do we also inventory what’s worth the most to us in our life? Does our investment of time match what we feel we care about the most? We’re often so busy checking off items on our To Do List, calculating what’s for dinner, and satisfying immediate needs that we postpone planning our future. If we want to accomplish the minimum in planning, it’s essential for us to appoint someone to represent us when we can no longer speak for ourselves (health care agent), as it is to make our end of life wishes clear, recording them to provide guidance for our agent. It is only useful to consider our own time of rest when we still have our wits about us. Later can be too late. According to Dr. Ira Byock, “Americans have long been chided as the only people on earth who believe death is optional.” Thinking about our mortality is not something that is familiar to us, nor practiced in our culture. The personal costs of our unrealistic expectations are mirrored by the social costs. 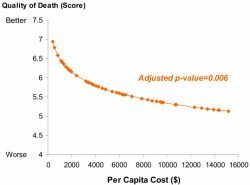 In a NIH study a decade ago, U.S. health care expenditures exceeded $2 trillion, with 5% of Medicare beneficiaries who die each year accounting for 30% of all costs1. One third of those expenditures in the last year are spent in the last 30 days of life, mostly on life-sustaining care (e.g. ventilator use and resuscitation), with acute care accounting for 78% of costs incurred during the final year of life. There are two significant things about this study. First is that the quality of a person’s life is not better, but worse when more costly aggressive care occurs. And secondly, that costs of care were nearly 36% lower for those who had end of life discussions compared to those who did not. Health Care Costs in the Last Week of Life: Associations with End of Life Conversations, 2009, B.Zhang et al. Of course we all want to live. But when it’s our time to rest, what are the goals that guide how we want to live? How can we encourage inner dialogues and conversations about this? Thought leader Dr. BJ Miller suggests that death is not a medical event, it is a universal life experience 2. Losses are inevitable, but we can dodge the regret about unnecessary suffering by thinking ahead. He says that if we pay attention, our end can honor the life we’ve lived. Wishlife was created to guide us into the territory of self-reflective dialogue, helping us overcome the hurdles that otherwise shift our focus away from what is more fun, more pleasant, and easier to do. How can we anticipate the inevitable end of our life with conscious choices, gratitude, and a sense of purpose? Let’s see if we can help you do that. Harriet is the Content Director at Wishlife and is responsible for working with top tier experts to develop Wishlife’s innovative, industry-leading guide.